My love for tassels clearly has not faded. They are fun, colorful and you can easily dress it up or wear them casually. I'm clearly obsessed. I have a few items with tassels I sell on my web store as well, so please, check it out! I have a party to attend and I fell upon some really amazing MILLY blouses on Shopbop. Whether you're looking to elevate your work wardrobe with bold designer blouses or fashion tops, such as crop tops, MILLY always crafts fresh blouses. Don't you think they would pair well with this tassel clutch? A fashionista problem I guess! Either way, both a MILLY blouse and clutch are headed to my mailbox real soon! What's your weekly want? I would love to know! I couldn't of agreed more! 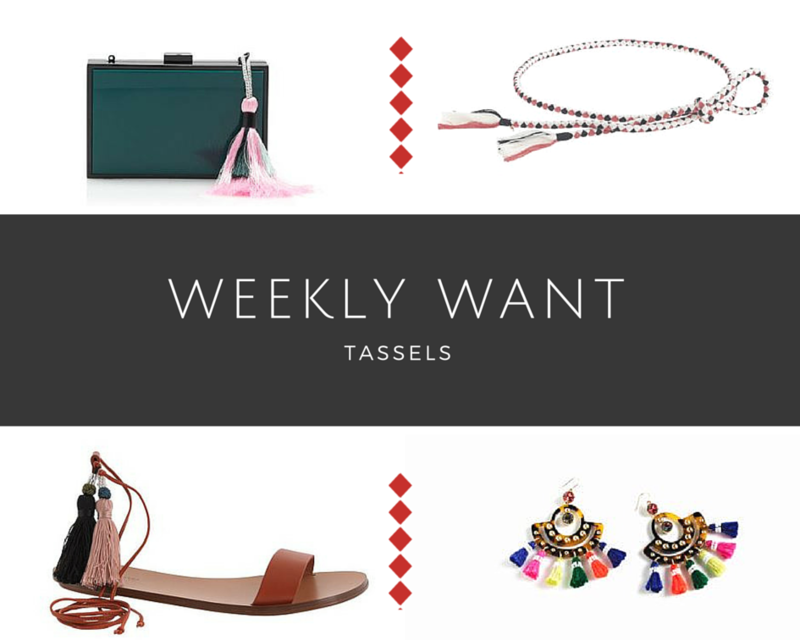 I am so obsessed with tassels recently! Fabulous picks! Lots of great stuff, I love that bag! Those earrings are beautiful. It's so unique. I want it! Sometimes I wish I were more "girly" and liked stuff like this or could pull it off lol! very pretty! !